Draplin Design Co.: DDC-166 "Fire! Fire! Fire! Lighter"
We finally made a lighter, extra excited, and then realized they are kind of tricky to sell online. Too weird to ship, so you’ll just have to catch up with us in the shop, at a gig or bazaar thing of some sort around Portland. 01. That basic, All-American Bic brand lighter. 02. Two colors! Inspired by flames. 03. 7/8” x 3” in dimension. Good for a front pocket, or rattling around in a tool kit. 04. Capable of lighting 1,000 smokes, but we hope that won’t be the application. 05. 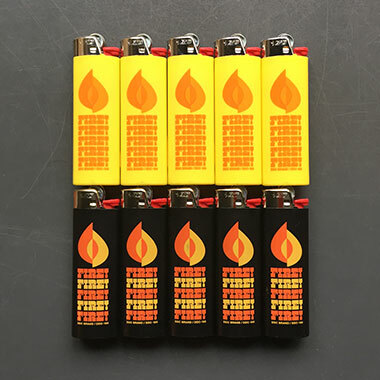 Great for sparklers, campfires, firecrackers, wood stoves, bottle rockets, guiding the way in dark tunnels, camping, dorm room candles, roman candles, bustling bonfires, sketchy fuses and that occasional cosmic bong rip. Incense, too, regrettably. 06. Figured out by our Portland buddies at Brewery Outfitters!